Grab a hold of the handle, and with a precise pull, tug (and slight jiggle) the door of the windowless cargo van slides open with a squeaking ease. Nevermind the unfinished corners or hodgepodge of baby gear, the first thing to catch your eye now, is a touch of unexpected modern and class. 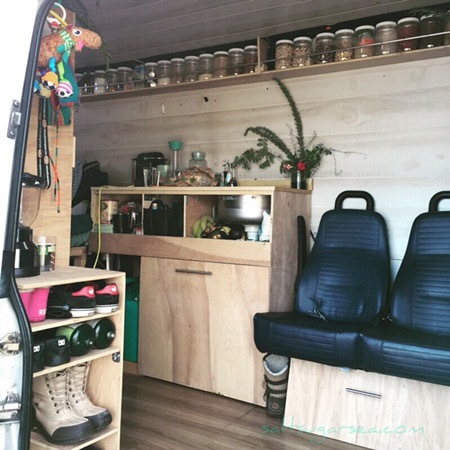 I present, our van conversion kitchen. A long floating shelf, crafted from the same unfinished birch as the kitchen cabinetry below, transparent mason jars sit on display all in a row. Secured in place by what appears to be a single aluminum rod, but is actually a few pieces strategically set in a straight line, the jars stay perfectly in place even on the road. Modeled after Borealfolk’s beautiful apothecary shelf, the jars serve as our dry goods storage, allowing quick and simple access to nuts, grains, coffee, tea, chocolates, and so on. While I was in love with the mason jars they used, The Husband was concerned with possible clanging when driving, so we went with 32 oz mason jar looking plastic screw top jars for this project. Amazon has been our go-to for most everything, but their large plastic jar section was lacking, so I searched elsewhere and found a 24 pack of 32 oz plastic jars for just $1.55/ jar from Uline.com. Here it is so far, now we just need to decide on some mini jars to add underneath. Love it! Now I want to know about the sink and how you rigged it. Isn’t it pretty?! This floating kitchen changed my kitchen world during our travels. We used a manual hand pump, large bar sink, some hose, and 2 6gallon water jugs to run the sink. I have some pictures up on Instagram but will have to work on a full post! This shelf is beautiful! I would love to have something like this in my kitchen. Is it difficult to get the jars in and out? No not at all! Although, we did test that before securing the shelf in place! We made the shelf just close enough to the ceiling so the jars wouldn’t have too much space to jump out (should we hit a bump), but low enough that (when tilted) they can easily be removed from the shelf.